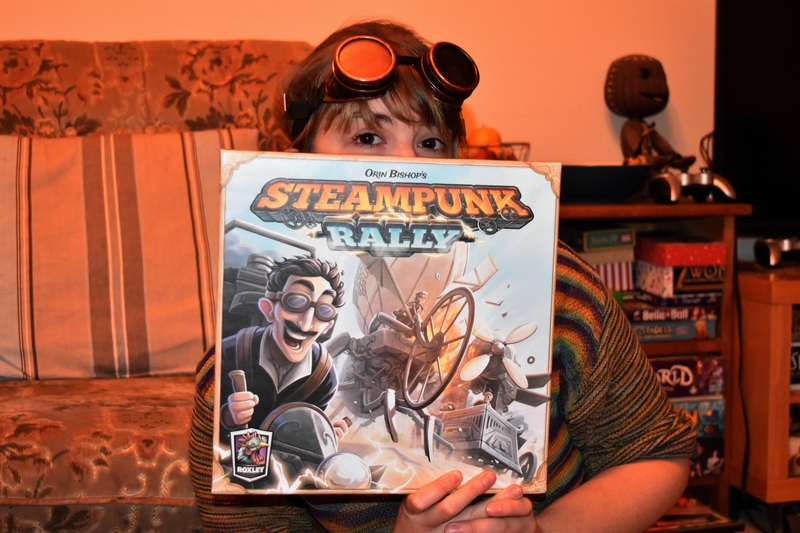 Steampunk Rally: A Rally Good Game! 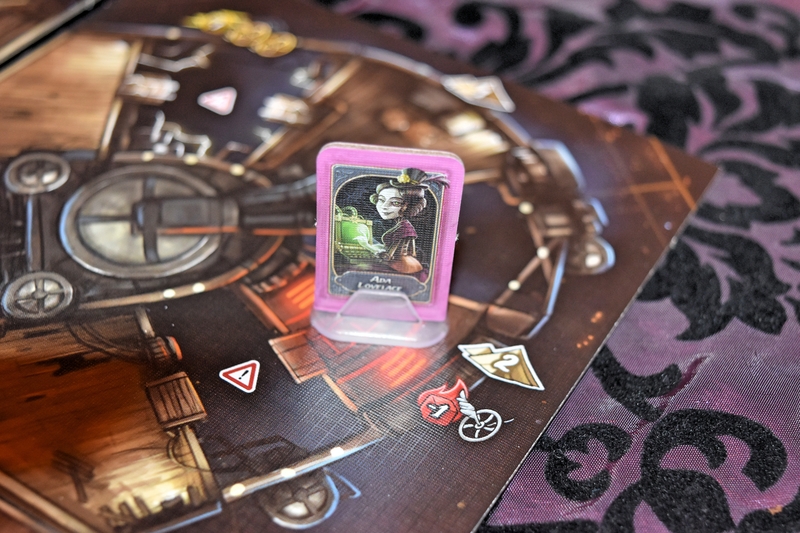 Each member of the Misery Farm had several favourite games to come out of Essen 2015. When pressed, all you can get out of us tends to be a pretty diplomatic and squirmy answer, along the lines of “well I loved so many of the games, I couldn’t possibly choose!” or “can’t I just say that I love all of them?” or “I CAN’T FREAKING DECIDE, LEAVE ME ALONE ALREADY”. We’re told this is similar to how some human adults feel about their children. Now we’ve brought (several copies of) the game back to our humble homes the excitement hasn’t worn off. To start off with, have we mentioned the characters? There are sixteen to choose from, all based on some of the coolest inventors that history has to offer. If you want a team of badass lady-racers (which you know very well your team of badass lady-journalists do), then you actually have a whole range of options! That’s right, A RANGE of female characters! This evening we plummed for Bob as Ada Lovelace, Briony as Marie Curie and Lizzy as Hertha Ayrton. 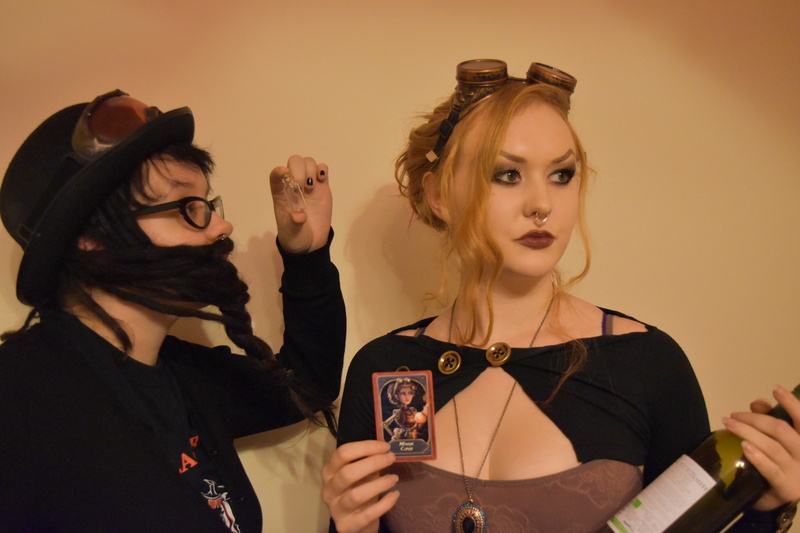 Briony had conveniently hosted a steampunk Hallowe’en party in her house a few days beforehand, and being the cool kids we are we grabbed a few spare steampunky goggles strewn around and got our race on! 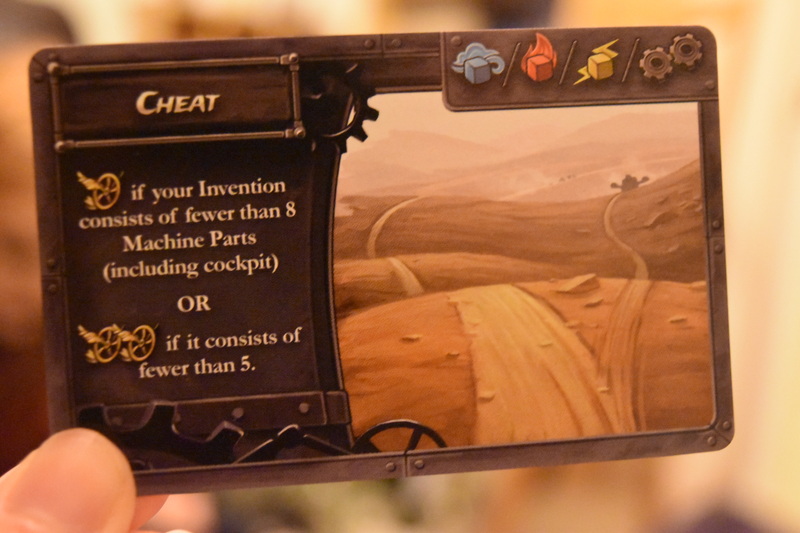 Each player gets their little chosen inventor card plus an additional unique card which, together, make up the start of your brilliant machine, which you’ll add bits to as the race goes on via a little valve symbol that lets you know more bits of machine can go there. Being the snazzy and intelligent inventors that you are you can easily unscrew some bits here and there and rearrange your machine as you go along, so you don’t need to worry too much about the order of placement (take that Galaxy Trucker!). The aim of the game is to win the race. You win the race by crossing the finishing line first. * Sounds simple and familiar so far, right? Racing 101. Oh! Also, you’re racing in a giant machine that’s constantly rearranging, powering up, and occasionally exploding – more on that later. Brimming with overconfidence, having not actually played since the trial rounds at Essen, we opted to play on the super-fancy FUTURISTIC HOVERDROME. More danger, but we could handle it. Robot power! Plus the map is a bit randomised at the beginning, which is always a bonus. 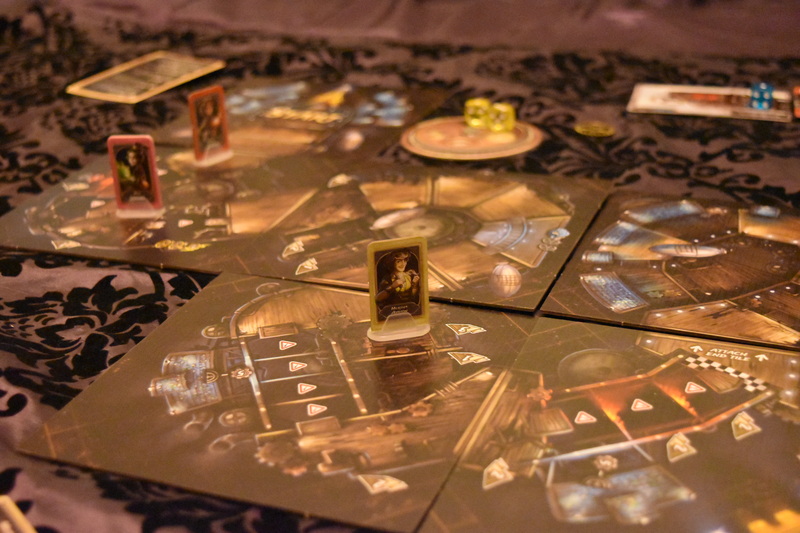 An actual turn consists of a few different phases, which each person does at once 7-wonders-style (or does slowly and in turn order if you haven’t figured out the rules yet, or if you just want to show off your rad moves). The first of these involves taking a card from a selection and passing the rest on. 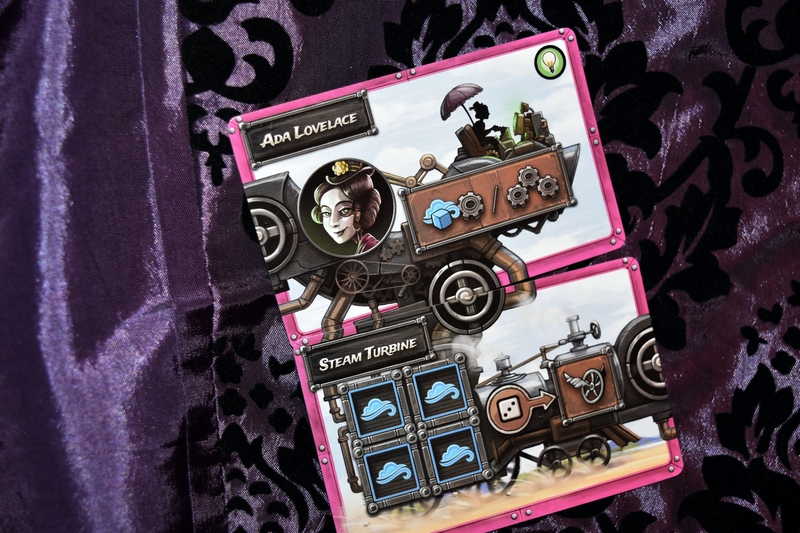 Here’s where you’ll use some of these cards to add bits on to your machine! Propellers, rocket boosters, a forcefield… should we chuck a time machine on there? Yeah, why not! 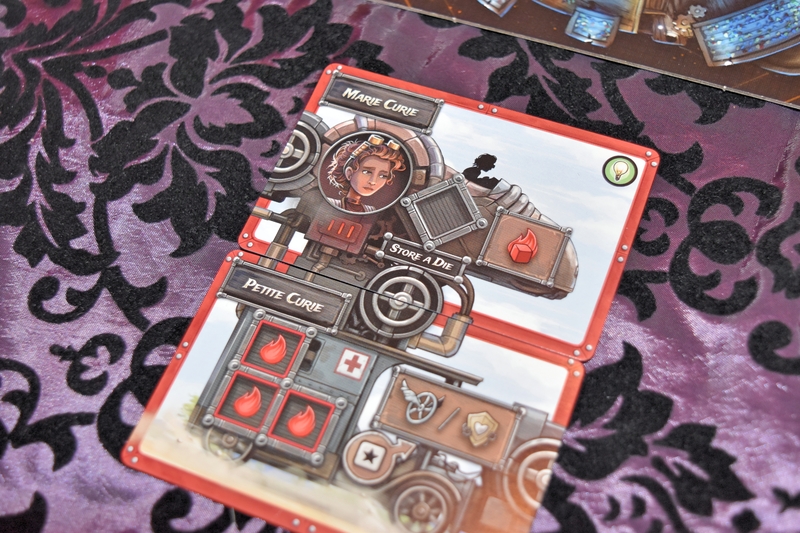 But the machine you’re building isn’t just about cool gadgets and aesthetics, it’s a beautiful, smoothly-running *cough* mechanism that uses water, electricity and fire power (dice of different colours) to bolster your machine’s defence or SPEEED madly along the track. Later in the round is the racing phase! Here you roll the dice you’ve generated that turn and see how much power (how many little winged-wheel symbols) you’ve managed to generate. The misery farmers were off to a flying start! 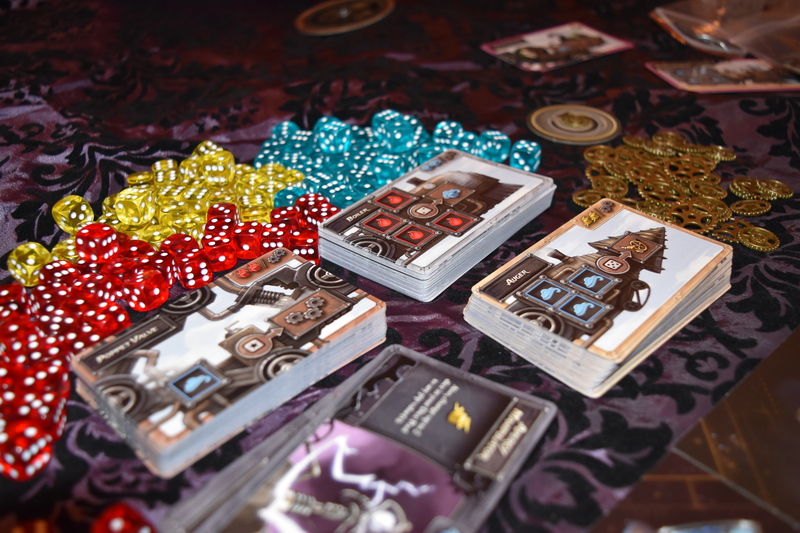 Each of us racing ahead with some efficiently running robot monstrosities, producing the dice and throwing them madly into the machines. Oh, remember that bit earlier where we glossed over the bit where your machines can explode? The final phase of a round is a ‘damage phase’, where you calculate all the damage you’ve taken from the terrain you’ve just hastily and cockily rattled across. The exploding machinery is probably the most unique mechanic of Steampunk Rally. For each damage you take which you haven’t defended yourself against, a part of your machine (of your choice) will explode and fall off. This can be a useful tactic at some points- sometimes it might just be worth losing some outdated bits of your machine for the chance to speed a bit further ahead. Maybe the force of the explosion is propelling you ahead a bit? Who knows! But uh, what happens if you take more damage than you even have bits of machine? Back into last place you go. Every single one of us had, despite being nominally-competent adult human beings, miscalculated the damage we’d take and exploded our machines completely. On the very first round. We definitely owed it to the great inventors that we were representing to pretend that that was a practice round and start over. Nobody wants that kind of a disgrace on their shoulders. Slightly more careful this time, the team of badass lady-racers (or just ‘badass racers’, if you will) had a much more successful second attempt at a race. The theme is excellently done, as you can tell from our enthusiasm over the characters. Marie Curie has a brilliant robot body because of the radiation poisoning done to her flesh one, but this just makes her even more hard-core than she was already. Which is tough, because Marie Curie is pretty hard-core even in puny human form. Lovelace is also a robot, having downloaded her consciousness into a robot casing. The depth of the machine parts is also great. You can build some pretty bizarre and beautiful machines! Impressively, it also plays with up to eight players. But it does this while still being strategic, rather than a game of luck. You can fit the same amount of players as Camel Cup, for example, but actually involves some skill and planning. Briony’s playing a giant-machine tactic. Unfortunately, she seems to have got a little bit carried away with building something beautiful and forgotten that she’s actually taking part in a race. Lizzy, going for a “try to win” strategy, keeps losing her galvanised galvanic brakes, but the lack of stopping power definitely seems to be playing in her favour, and she’s speeding to victory. The way that the phases work together is good for a larger number of players, so you’re not spending too much time waiting for other people to make their moves. But there’s definitely something lost when everyone races together, and it has a bit less of an exciting or sociable feel to it when you don’t get to watch everyone else’s smoothly running machines creating the perfect amount of water for their steam machines and then trudging along, or completely misjudging their power, going too far and falling in a hole. We prefer doing that part of the game one at a time, so we get to watch each other’s’ triumphs and disasters as they unfold. 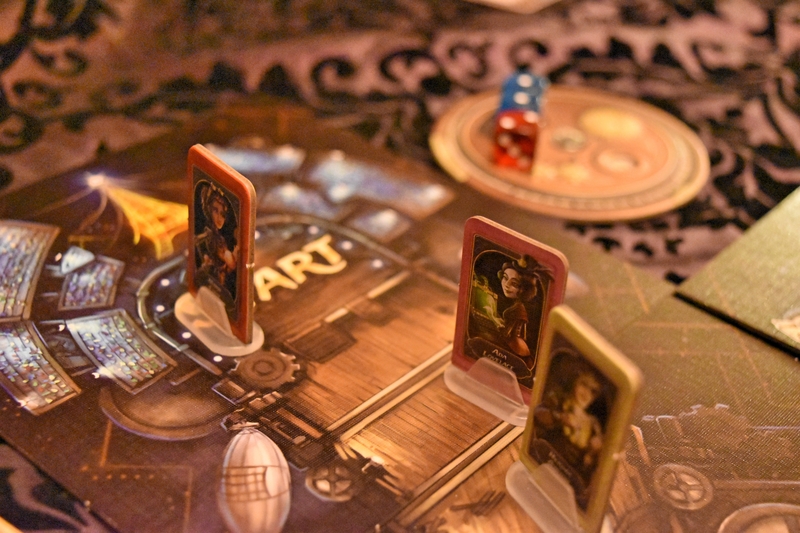 The game is a winner both on theme and gameplay. 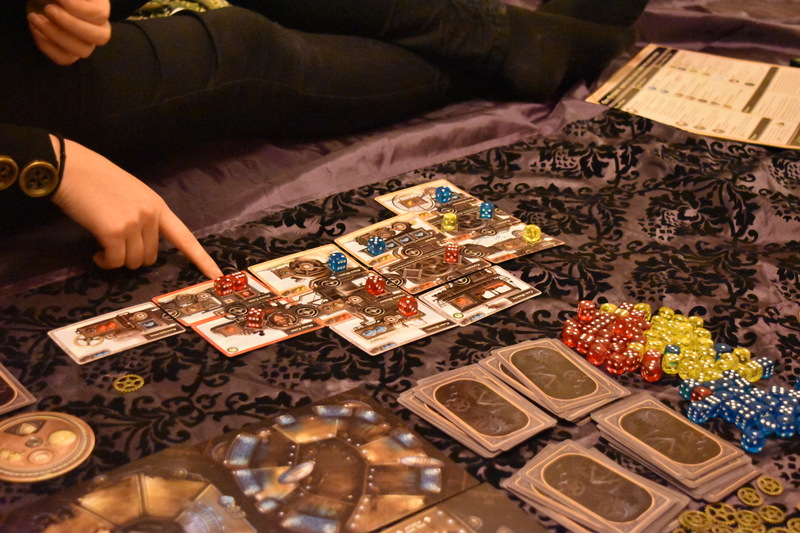 It’s a great game to get your friends excited, and although there are certainly games that are more in depth, more strategic, and more ridiculous, it plays a pretty good role in our board game collections. Of course, as always, the real winner is board games. And Lizzy. *You can also cross the finishing line at the same time (on the same turn) as someone else, but then it’s about how far over the line you get. It’s not literally a case of who moves their character over the line first winning, because that would be madness of a different kind.